Frame #1: The left arm enters and immediately bends at the elbow while medially rotating the upper arm. The right arm is extending and starting its "round-out" movement to conserve energy. The right leg commences to kick to balance out the vertical force component of the entering left arm. The head begins to turn to the right preparatory to breathing. Streamlining is maintained with the trailing left leg behind in the shadow of the torso. Frame #2: The left arm continues to bend at the elbow and the upper arm medially rotates further. This is a re-positioning movement that will establish a classic "elbow-up" position to maximize propulsion. The right hand is ready to exit. This is an efficient position where propulsive force is terminating with the right arm and beginning with the left. There is little time in this stroke where propulsive force is not being applied -- a high degree of propulsive efficiency. The head continues to rotate to the right and the right leg kick is near completion. Frame #3: The "elbow-up" position for the left arm is clearly displayed. It is worth noting just how little the elbow has moved in the prvious .2 second period. The deep left kick is completed and has served to balance some of the vertical force component created by the exiting right arm. The shoulders and hips have rotated to their full extent. Inhalation occurs. The left leg is rising preparatory to kicking. Frame #4: Left arm propulsion is generated by the hand/forearm surface as force is mainly developed through upper arm adduction. The right arm is recovering fast and the left leg is well out of the water preparatory to kicking. Breathing is completed. The right leg rises to streamline behind the torso "shadow." Frame #5: Propulsion is still delivered by left arm adduction with the hand/forearm surface. The head has returned to look to the pool bottom and the recovering right arm is stretching out and over the water. The left leg kick commences. Frame #6: Left arm adduction and final propulsion from the hand/forearm surface is complete. The hips and shoulders have rolled to be almost flat. The left leg kicks. The head is well down and the face looks to the pool bottom. Frame #7: Left arm propulsion continues with the hand but the forearm loses its influence as elbow extension occurs. The right arm enters long forward with only a hint of elbow flexion but obvious wrist flexion. The left leg kicks as the shoulders and hips roll away from the left side. The trailing right leg is in the shadow of the torso. Frame #8: Once again the transition from one arm's propulsion to the other in an almost continuous manner is displayed. The right arm is held fairly long and presses down although the pitch of the hand will direct considerable force backward. The head rotates to the left allowing the shoulders complete freedom to roll. Frame #9: The right arm begins to bend more at the elbow bringing the applied force more under the swimmer. Upper arm adduction begins to apply force. The left leg has completed its kick. The outlined recovering left arm shows that the arms are almost totally opposed to each other. Frame #10: Adduction of the right upper arm provides propulsion for the hand/forearm surface. Left arm recovery starts to stretch forward over the water. Frame #11: Right arm propulsion from upper arm adduction is almost completed. The left arm approaches entry. Frame #12: The position displayed in frame #1 is once again assumed. 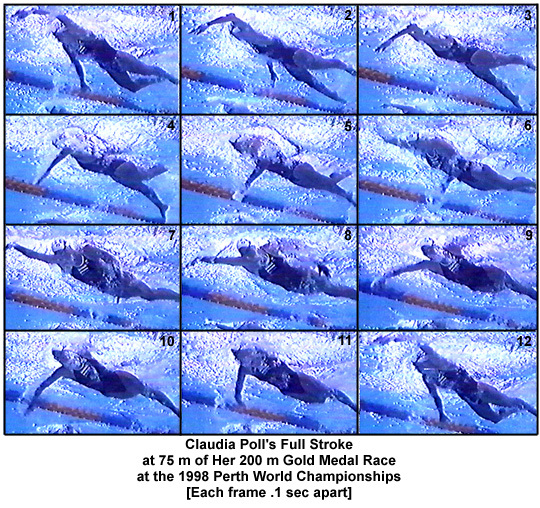 Good streamlining and continuous force application are obvious strengths in Claudia Poll's two-beat kick stroke. If she tried to fit in a four-beat kick it would alter her arm-stroking pattern markedly, almost asuredly to her detriment. This is a good stroke to emulate particularly in girls/women who like to rate high.